According to James Sulikowski, a shark expert at University of New England in Biddeford, great white sharks and the beach goers they sometimes scare have a lot in common. Of course, one of those species is a serious threat to the survival of the other. Humans kill an estimate of 100 million sharks every year — sharks, in contrast, kill an average of five humans worldwide annually. On Saturday, there were three reported sightings of great white sharks off the coast of Maine, coinciding with the 40th anniversary of the release of the movie “Jaws,” a Hollywood horror that made the razor-toothed predator nature’s best-known villain. By Monday, Sulikowski and others had largely concluded that the animals sighted on Saturday were more likely the massive — but peaceful — basking sharks, not white sharks. But the scientist said Mainers should be hoping for more sightings of the predatory beasts, not less of them. For starters, that could be a sign the sharks, who are classified as threatened, are growing into a healthier population. And thanks to their similarities with humans, it takes a long time for white sharks to grow into a healthier population. Why would Mainers want a healthier population of great white sharks off their coast? As counterintuitive as it may seem at first, he said a healthy great white shark population leads to healthy populations of seals and other sea animals the sharks typically eat. “They definitely are sleek, they’re built for speed and they’re built to be the apex predator, but they are really attracted to dead, dying or injured prey items,” he said. 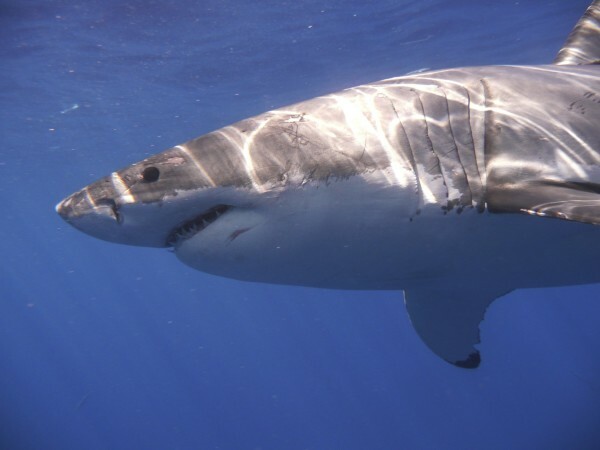 Great white sharks thrive by eliminating the weakest prey available, gobbling up creatures who might otherwise pass on those traits to offspring, effectively “strengthening the gene pools” of seals and other marine animals, Sulikowski said. According to the data, the sharks won’t attack you. Never in the history of Maine or New Hampshire has there been an unprovoked shark attack on a human. Even with human obesity statistics heading in the direction they are, people can’t compete with whales as a fatty food source for sharks. Every year, an average of between 40 and 50 people die from lightning strikes in America — almost 10 times as many as die worldwide from shark attacks. If you see a huge fish with a dorsal fin sticking out of the water, there’s a good chance it’s not a great white. In one of the three reported great white sightings, a man fishing about 26 miles off the coast of Portland said he saw a shark pull up alongside his vessel — and that it was about the same length as his 22-foot boat. According to the Canadian Shark Research Center, the largest great white shark ever accurately recorded was a 20-footer caught in 1988 off Prince Edward Island, although unproven tales of 22- and 23-foot great whites have popped up around the world over the decades. “Basking sharks are big — they’re bigger than white sharks,” Sulikowski said. “If you were to overlay a white shark with a basking shark, you’d find they’re nearly identical. But if you look closely, you can see some differences. The dorsal fin of a basking shark is more rounded at apex, while the white shark’s is more pointy. Some of the video that’s been going around clearly shows a more rounded fin. Basking sharks, by comparison, are the world’s second largest fish, regularly reaching the 20-26-foot range. Great white sharks deserve more study. Sulikowski noted that the solution to reducing shark-human interactions is to give the white sharks more personal space, not vice versa. If people understand the still enigmatic great whites better, they can determine how to keep out of the animals’ way, the scientist reasoned. Maine waters aren’t too cold for great whites. A common misconception that prevailed for years was that waters off the coast of Maine are too cold for white sharks, but with more regular sightings here, that myth seems to have dissolved somewhat in recent years. The massive razor-tooth fish was made one of nature’s best known villains in the 1975 Steven Spielberg horror movie “Jaws,” and is listed by the cable network Animal Planet as the natural world’s No. 1 predator — ahead of lions, grizzly bears and crocodiles. Kohler said great whites can be found in waters as cold as the low 50s. According to the National Oceanographic Data Center, the average ocean water temperatures from Portland to Bar Harbor remain in the 50s from June through October. So as long as there are great whites out there, they’ll come up along the coast of Maine. Sulikowski and others argue that’s good news for Mainers.